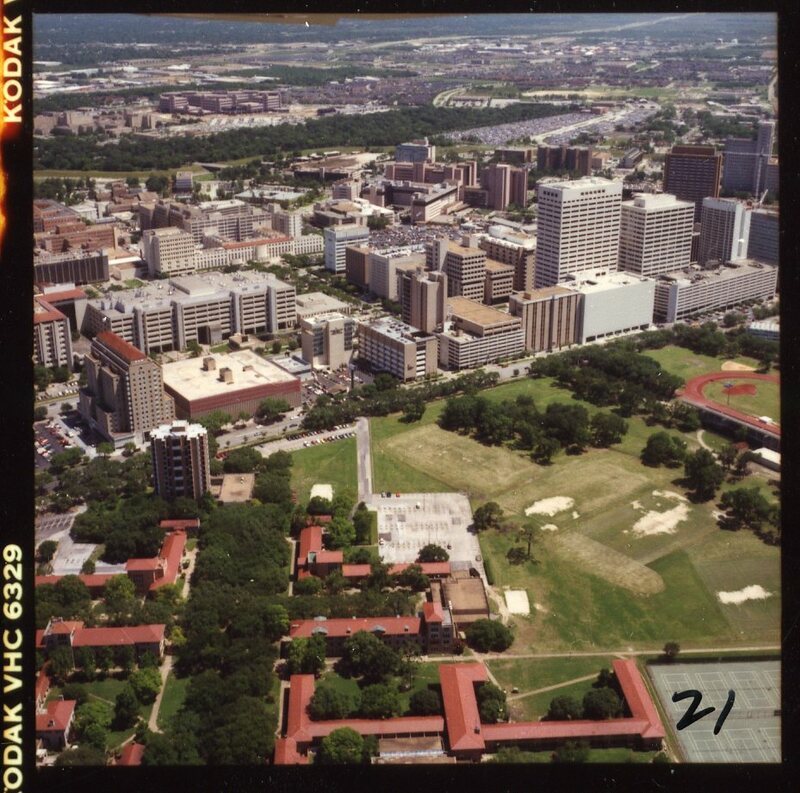 I’ve had a very, very long day and one of the most curious pieces of it was the discovery in the HMRC of these shots from the WoodAllen Collection, ostensibly of the Med Center but clearly showing the Main and University corner of campus. 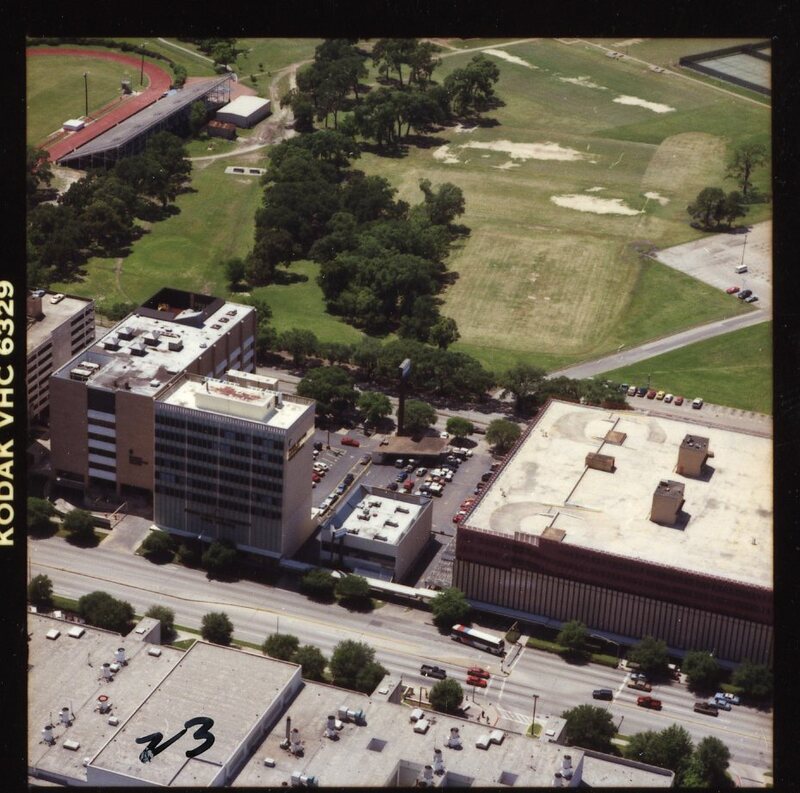 I’m not totally sure of the date–somewhere late 80s to mid-90s seems likely–but what in the heck is going on in the area next to the old stadium?? Here’s a closer look at it. Does anyone know why it was mown in this fashion? Well, they used to play intramural sports on those fields around that time. Like ultimate frisbee, touch football, powder puff, that kind of thing. That’s right. I lived there in Wiess’s Tennis Court Wing during my time (84-88) and could see many a football game off the balcony. Could it be the creation of the detention pond which is there now? Also, in the second photo you can see two small circles, one on either side of Harris Gully, mown into the grass. This was used for chipping practice in the golf portion of the PE class we were required to take. Yeah, I agree, that looks sort of golf-practicy to me. of the native prairie weeds which can grow 5” in a day? That’s not dirt – that’s either sand or oyster shell. Sand seems much likelier. You can see some dirt between the pathway and the steel building behind the track stadium – dirt is darker. 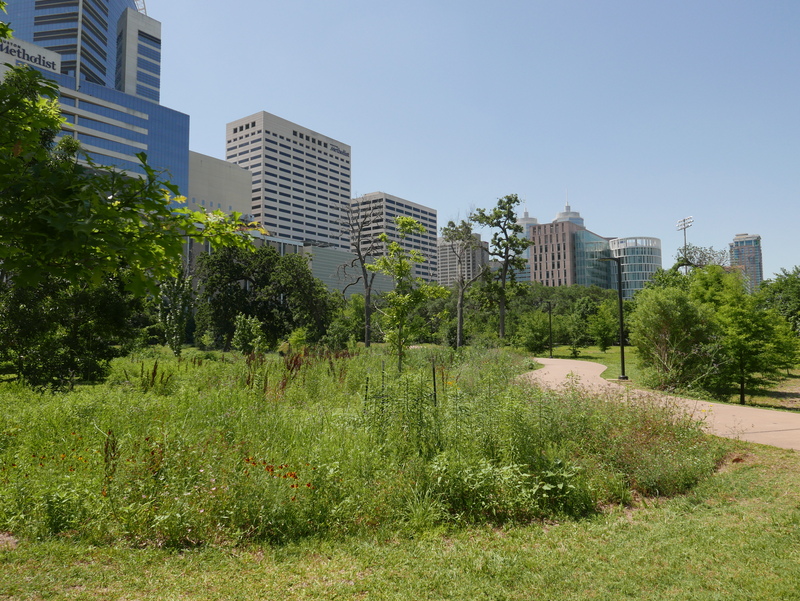 Were they filling in parts of William Rice’s marsh? I had a vague memory of some kind of tournament played in that area of campus, but I haven’t found a search that turns up manageable results. Those were intramural fields then; my fellow Sid Men & I played many a football, softball, and soccer game there in the mid to late ‘80s.